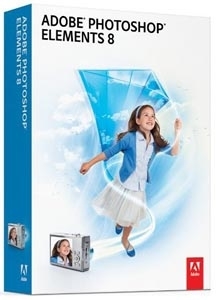 Adobe Photoshop Elements 8.0. 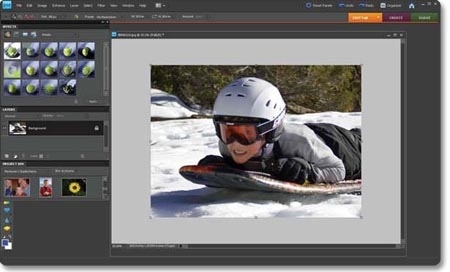 Latest version of photo editing software combines power and simplicity so you can easily tell amazing stories with your photos, Bring all your photos and video clips together in one convenient place where you can easily find, view, and manage them; protect them with automatic online backup and 2GB of free storage; and then dive right into a full range of creative activities. Make your photos look extraordinary with editing options that let you recompose photos to any size while keeping key subjects intact; combine multiple exposures into a single, perfectly lit shot; and quickly preview a range of adjustments before choosing the perfect one. And share your stories in unique photo books, scrapbook pages, slide shows, and interactive online experiences. It will be accessible in Windows and Mac, available next month. With advanced features added for those expect more than what they have in most photo editors, Elements 8.0 target overall audience intended for regular and casual users. It has an improvised Oraganizer and also Auto- Analyzer that tags automatically and featuring the face recognition technology similar to Google’s Picasa 3.5 People Recognition.